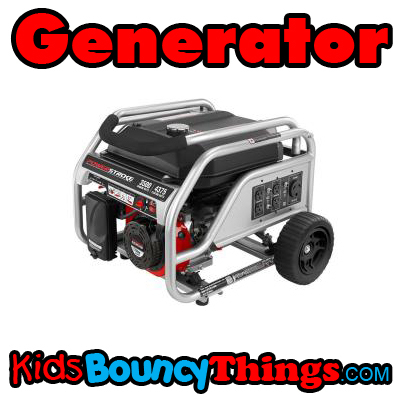 This generator should power 1-3 units, depending on the unit and the power consumption of each unit. A number of hours it runs will depend on the power load. You are responsible for refueling the generator if it runs out of fuel. You may rent extra fuel from us for an additional fee. Our generators use Premium Fuel. Generator Use Policy: We do not recommend the use of a generator, but when needed we will provide one. Generators are machines and can not be guaranteed. There are many variables that go into play when using generators. We will set it up and make sure everything is running and working, but if the generator fails or was to run out of gas during your event, you are responsible for refueling unit during and after use. If the generator fails for any reason, make sure to give us a call to help with some common troubleshooting issues. However, your event will not be refunded and another generator cannot be guaranteed. We will provide you with a running generator that has been inspected by our in-house service team and will be working to the best of our knowledge. WE HIGHLY RECOMMEND USING A POWER OUTLET OVER A GENERATOR! Once you click check availability, you agree you have double checked your order and it matches the specific event time of your party. It also matches the chosen product options. Make sure you have the right date, right time, and right method delivery or pickup. If they DON'T match the equipments time frame, you may not get your rental.